Manila Water Foundation (MWF) and Boracay Water recently turned over a public restroom facility located at Cagban Jetty Port in Malay, Aklan to help promote proper sanitation and hygiene among locals and tourists. In this photo are (L-R), Provincial Port Administrator Nieven Maquirang, Boracay Water General Manager Joseph Michael Santos (4th), MWF President Geodino Carpio (5th), Sangguniang Panlalawigan Member Esel Flores (6th), Barangay Manocmanoc Captain Chona V. Gabay (7th), along with employees from Manila Water Foundation, Boracay Water, and representatives from the provincial and local government of Aklan. In an effort to help preserve the beauty of Boracay, Manila Water Foundation (MWF) and Boracay Water partnered with the Provincial Government of Aklan in building a public restroom facility which aims to promote proper sanitation and hygiene among locals and tourists. 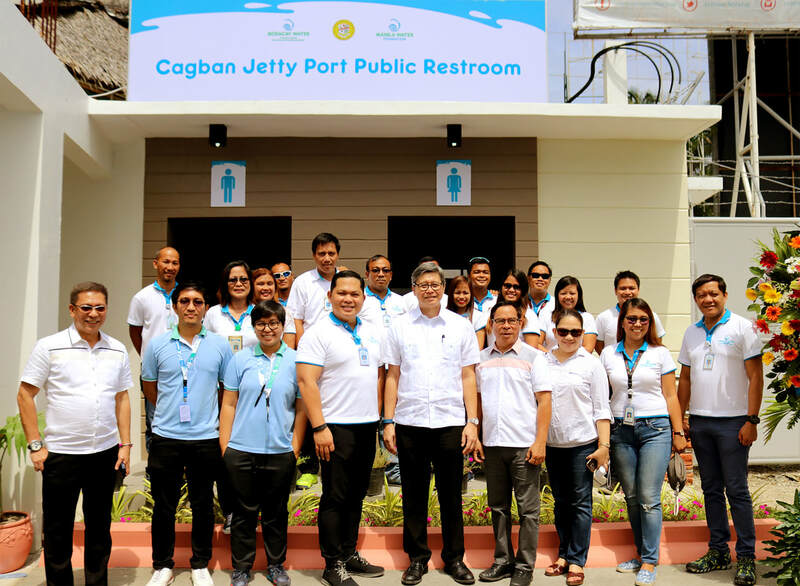 Recently, the said organizations officially turned over the public restroom that is located at Cagban Jetty Port, which serves as an important tourism and transportation facility for the conveyance of people and cargo between Boracay Island and Barangay Caticlan, Malay, Aklan, to other ports in nearby cities and municipalities. Being one of the busiest ports in the region and a gateway for millions of tourists who visit the Island of Boracay, Cagban Jetty Port was in need of an additional toilet facility, as cited by the Provincial Government of Aklan. With the help of Manila Water Foundation, the co-funding and technical expertise of Boracay Water, and the land donation of the Provincial Government, the construction of the toilet facility, both for male and female with five water closets and three urinals, was made possible. Through the construction of the public restroom, it is expected that locals and tourists alike will have a better access to sanitation facilities which can positively contribute to the promotion of proper hygiene and improvement of public health. Aside from this effort, Boracay Water also recently constructed a lift station which aids the transportation of used water from low elevation sources towards sewage treatment plants. Through this facility, it is ensured that used water from the public restroom and other facilities near the Cagban Jetty Port will be treated and will be safe once it is discharged to the environment. Present during the turnover ceremony was MWF President Geodino Carpio who shared more about the importance of having the public restroom and supporting sewage treatment system in preserving the beauty of islands like Boracay. “If we’ll think about it, toilets are simple ordinary things, but these are components of a large and complex infrastructure called the sewerage system. These facilities are very important in the collection, transport, treatment, and safe disposal of sewage. If sewage is disposed without proper treatment, our natural resources, such as the bodies of water, will be placed in peril. With the construction of these facilities, we are happy to be able to contribute to the preservation of our environment and islands like Boracay,” he explained. The public restroom at Cagban Jetty Port is the first sanitation project of MWF outside Luzon. With the completion of the said project, MWF was able to push for better WASH (Water, Sanitation, and Hygiene) access for the Province of Aklan which was also made possible through several engagements made in the last five years. Among these initiatives were the provision of potable water to the communities of Sitio Nabaoy in Malay and Ati Community in Boracay, installation of drinking fountains and handwashing facilities in schools, police stations, hospitals, and other public institutions in the province, and the promotion of proper handwashing through the celebration of the Global Handwashing Day. In line with this, Aklan Governor Florencio T. Miraflores, through Sangguniang Panlalawigan Member Esel Flores, imparted a message of thanks while citing the importance of public-private partnerships in the delivery of basic water and used water services in the Province of Aklan. “We would like to thank our partners from Boracay Water and Manila Water Foundation for their generosity in providing us with this much needed facility. This is again a confirmation of the strong partnership of the local government and the private sector. We can really make a difference in the delivery of much needed services. Likewise, by investing in sophisticated water treatment facilities and sewerage systems, we are able to protect and preserve the natural beauty of Boracay,” he shared.